Stephen Fry’s presence on Twitter, along with his advocacy of the site in its early days, has long been a topic of much discussion in the social media space, as well as in our mainstream media. Coverage of the networking site – and particularly of Mr Fry’s relationship with it – seems to have died down exponentially of late, despite its continued popularity with a wide range of users. 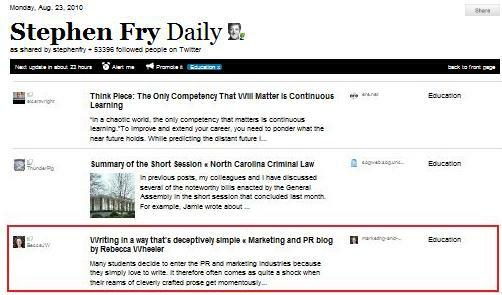 Stephen Fry inadvertently shone the spotlight on this blog on Monday, when its post on writing for the marketing and PR industries was featured in the @stephenfry Daily. The Daily is a collation of news and links that have appeared in an individual’s Twitter feed that they can share with their followers if they sign up for the service. So thank you, Stephen, for your continued use of Twitter and for sending a few extra readers in this direction! Many students decide to enter the PR and marketing industries because they simply love to write. It therefore often comes as quite a shock when their reams of cleverly crafted prose get momentously reduced to just half a page which contains only the essential details. For PRs who are sending news to the media, less definitely means more to the journalists who are bombarded with hundreds of announcements on a daily basis. The marketer’s job is hardly any easier since members of the general public rarely have much more time than the journalists as they battle their way through daily life just trying to find the information that they need. With attention spans as short as these, there’s simply no space for cleverly crafted analogies or page-spanning metaphors; people just need the details in a digestible format. So the next time you’re drafting a quick media alert, writing a case study or putting together a brochure, make sure all of the important bits are at the top and keep your creative overdrive under control until you can be sure that it isn’t masking your message. Paying a professional agency, copywriter or consultant to write for you can often be a challenging experience. They may return just a few paragraphs from countless pages of background information; reduce your company overview to a few brief sentences; rarely use the big and clever words that you think they should know and work with daily. Instead you’ll get impactful, effective and to-the-point writing that simply does its job well (if you pick the right people to work with, of course). The value of really good marketing writing lies in its deceptive simplicity. When you embark on a career in public relations, you accept very quickly that your name is rarely going to be the one that you see in lights. Instead, you celebrate and can’t help but smile when your clients’ brands, products and spokespeople appear in print or online as a result of your day-to-day workplace efforts. The digital world has brought about a change though, with personal profiles becoming almost impossible to subdue. A blog like this one can not only be a place to record ponderings on issues that arise in my work, but also an undeniable promotional tool for my personal “brand”. 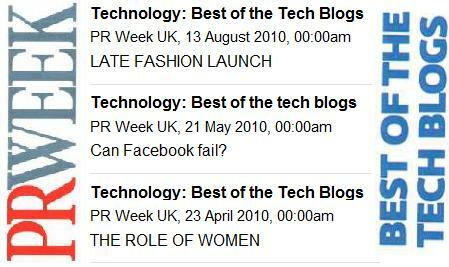 Since launching marketing-and-PR in April 2010, it has been featured three times in PR Week for which I am incredibly grateful. There’s a certain thrill that comes with seeing your name in a magazine, but I also hope that it might encourage more PR professionals to visit the blog thereby expanding its reach and improving its search potential. Not everyone shares my aspirations though. A number of bloggers would rather conceal their identities or create new ones so that they can blog in disguise. This way their professional profile is not compromised by anything they share on a personal blog. The evolution of a personal online brand can be coincidental and a surprising reward (as this blog seems to illustrate) but some individuals in the industry – entirely unlike the anonymous bloggers – pour their hearts and souls into the brand building task every single day. Blogging and Twitter have made it easily achievable but they can also put a person’s true identity in shadow so all that the world sees is a projection of expertise. For instance, retweeting others’ comments and links they have shared on Twitter can very quickly make you look like an expert on a subject. Whether you read the posts that you’re recommending before you do so is almost irrelevant to your followers who will perceive you to understand that wealth of information. Of course I’m in no way promoting this activity, but it’s interesting to analyse how it can seem to an outsider who hasn’t thought to look beyond the mask. A blog is a rather different exercise as the posts should contain fresh, new ideas. It is fairly easy to see when there’s little substance behind a post and when others’ experiences and opinions are being projected rather than those of the writer himself. So, before you decide that someone you’ve found online is the new authority in your industry and their every word must be believed, make sure you check out their credentials a little more carefully and see whether you can decide how much substance is really behind the facade. H&M and Zara prepare to launch online stores – but are they turning up too late to the party? Two high street fashion giants, H&M and Zara, will finally launch their ecommerce stores for the UK next month. It’s been a long time coming and I can’t help but wonder why it’s taken them so long to jump on the bandwagon. H&M has also done a good job of creating buzz ahead of the ecommerce launch, inviting interested customers to sign up to receive the e-newsletter and shop the online store before its official launch. So if H&M already has a presence online and appears to really “get” social media, why has it taken the retailer so long to launch its online store? The online Zara store poses a similar question. It’s a retailer that has been selling homeware online for some time now but bizarrely its fashion comes as a rather late addition. Why this is, I’m simply not sure. Could they have doubted women’s willingness to purchase clothes without the changing room experience? Women just love to shop, and we found a whole new way for them to do it. Of course they will buy without trying things on because it is the act of shopping! She’s been proven right, of course, and the success of ecommerce is clear for anyone to see. By already doing so much right online, expectations are high for H&M and Zara’s new ecommerce stores. One thing’s for certain though (and I’m sure they’ll be pleased to hear it), shoppers in the UK simply can’t wait! Watching TV adverts has become a rare occurence for me since the introduction of Sky+, but I happened to be watching a programme live last night so was forced to sit through an ad break for the first time in weeks. Thankfully, I picked a good viewing slot and was treated to the latest installment in BT’s “Adam and Jane” story which has filled our screens since 2005. For an ad concept to stick around for this long, there must be something about it that really works. In my opinion, it is the human interest angle that ensures we don’t give up on this fictional couple and continue to be interested in their story (and somewhat obsessive use of BT tools and services). BT has recognised that the pull is so strong, it has even invited us to have our say about what should happen next in the series of adverts. It’s a fantastic way of getting viewers and potential customers to directly engage with the brand (and each other via a community comments board) and feel like they are actually being listened to by a giant organisation. Logging on and casting your vote takes just a few seconds but ensures that you will be eagerly watching out for the next advert from BT. How many other brands can guarantee that their costly adverts will have such an avid audience ready and waiting? BT has already shown that it knows what it’s doing in the social media space with its @BTCare Twitter profile that has been successfully running for some time now. This latest advert idea simply cements the telecom giant’s understanding of not just online but multi-channel engagement. Well done, BT!